If you are local to the Detroit area, chances are you have been to Eastern Market at least once in your life. If you are a foodie like me then chances are you have visited several times. Eastern Market is a bustling area of visitors looking for the best deals on fresh produce, other food items, and flowers. Through Groupon, we have also discovered a miraculous place nestled down there in all of the action, DeVries & Company 1887. We regularly purchase Groupons to get some good bargains there and we went equipped with one yesterday to stock up on some unique foods. Each and every time you visit Eastern Market it is a different experience because there are different vendors. My family of three really values these trips down to the city to explore all of the foods that Eastern Market has to offer. Yesterday it was just my husband and me on a little day-date while my daughter hung out with her friends. Our first stop was DeVries & Company 1887 and we got a wonderful haul there. Then we stopped into the sheds at Eastern Market with our canvas shopping bags and filled those bags up with a plethora of foods. When I come home from these trips I unload my bags and marvel in all of the glory of having these available in the Give It A Whirl Girl kitchen. My day is always made on these trips and I treasure them in my memory and mind. Eastern Market in Detroit, MI – The home of many food vendors selling produce, meat, cheese, plants, and flowers. DeVries & Company is a large historic building with three levels of fun finds. Yesterday we only explored the lower level where a majority of the foods are kept. The other two levels are gift shops where you can obtain some neat things. This place is well-known for their cheeses. We have bought some in the past from DeVries & Company 1887 and had a cheeseboard full of them at a Wine & Onesies party and the cheeses were a big hit. There are numerous to choose from here and if you like cheese there is a cheese for everyone that can be located here. Check out their Facebook page to see their cheese offerings which are regularly posted. They also have a variety of interesting meats to pair with your cheeses. You will have the best cheeseboard in town if you stop in here to stock up! DeVries & Company 1887 is more than just a meat and cheese shop. This place is like a little grocery store with gourmet foods and uncommon, specialty food products. Pro tip: grab a Groupon and save some money here. You can get a $50 voucher to shop with for around $20-$25 and get more bang for your buck here. If you recently stumbled upon my 100th post on the blog I discussed two different, unique balsamic vinegars used to create a chocolate-raspberry nice-cream. This is the place where you can pick up some bottles of those (there are several to choose from and they are all imported from Italy). There is also a wide variety of various oils by the same brand (Fanchone Gourmet) that you can sample here. You won’t leave empty-handed after trying these out. They all have interesting flavor profiles and they will help take your cooking to the next level. The Meyer Lemon oil was fascinating and I really should have bought that one because that would likely result in the greatest chicken piccata known to man! I am a curious eater and I live for the adventure of trying new foods. You all know that. That’s why my blog is titled, “Give It A Whirl Girl”. In the photos below I am letting you see a sneak peek of a few things I took home with me. I am super duper pumped and excited to experience these foods. I have a major mad addiction to anything raspberry flavored and I couldn’t pass up this Traverse Bay Farms Raspberry Salsa. This was my first time seeing a raspberry salsa so I had to swoop this up! My husband also talked me into bringing home some mango salasa bag of chips from Aunt Nee’s. A fun, tutti fruitti treat for your cupcakes, French toast, fresh fruit fancy drinks, just about anything that needs a giggle. I really don’t have a plan for this sugar just yet. It was my big splurge item at DeVrie’s. It was $11 for a 14 oz can. I will figure something out soon though. Maybe I can whip up a batch of cupcakes next week and incorporate Mr. Gigglepants into it. Let it be known, I think Guy Fieri is annoying as hell. (insert lols here). I spotted his Root Beer Barbeque Sauce and could not pass it up. I bought it with the intention of making some pulled pork sandwiches with it. Whenever I made pulled pork sandwiches I always cook my pork in root-beer. Sounds weird right? But it is so good! When you go to Eastern Market there is a ton of stuff to take in and see all around you. There are tables set up with fresh fruits and vegetables, there are people selling their homemade salsas, honey, fresh pierogi, succulents, and flowers, etc. There are two different ways to visit Eastern Market. You can arrive early when everything is all set up and available. Or you can arrive mid-afternoon when the vendors are about to close up for the day. They want to sell what they brought with them so you will be walking by and the vendors will be shouting out deals to you. It happened to me yesterday. We came late in the afternoon and I scored some great deals. I got a carton of strawberries for a dollar. I also got some blackberries for a dollar. Those prices sure do beat the local grocery store prices. I do realize I made a bit of a boo-boo with my photos here. I must have been just vegetable obsessed because I just realized I did not shoot any photographs of fruit and Eastern Market has a huge load of fruit to choose from at really reasonable prices. So I am very sorry about that. Next time I visit I will be sure to snap some photos of fruits. Purple kale at Eastern Market – what a gorgeous color and it appears to be so fresh! Quail eggs and duck eggs for sale at Eastern Market – now that is something you do not see every day! Spice Miser at Eastern Market – This vendor is a must-see! Spice Miser offers a huge variety of seasonings and spices. Be sure to take home a bag. I always make sure I bring something home from the Spice Miser. There are gigantic murals painted on the buildings all over the Eastern Market area. Be sure to take a stroll around and snap some pics of the art. As you can see here I have a pretty decent haul from both DeVries and Eastern Market. I love getting home and unloading all of my newly acquired foods. I am already looking forward to my next trip back. 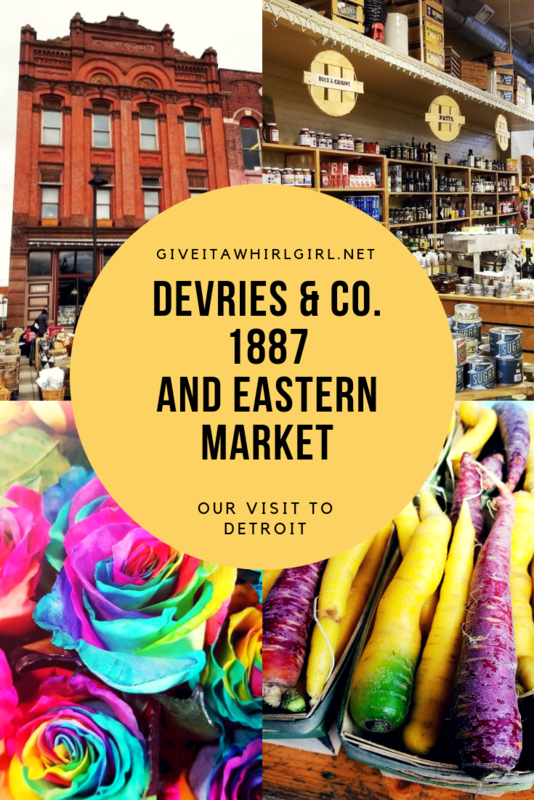 Have you ever visited DeVries & Company 1887 in the Eastern Market district? Will you be purchasing a Groupon to shop there? Have you ever went to Eastern Market in Detroit, MI? What is your best memory? Please share by leaving a comment. Eastern Market website- check this page often because there are always special events being held here. This entry was posted in Local Spots I Visited and tagged bananas, barbeque sauce, bell peppers, black garlic, blackberries, brussels sprouts, butternut squash, carrots, cheese, chocolate, detroit, DeVries & Company 1887, eastern market, eggplant, exotic mushrooms, flowers, fruit, garlic, Groupon, Guy Fieri, haul, hibiscus sugar, honey, Indian corn, jelly, Jelly Belly, kale, mango salsa, marzipan, meat, michigan, Mr. Gigglepants, mushroom, peppers, produce, purple carrot, purple kale, purple pepper, raspberry, raspberry salsa, raw honey, root-beer, salsa, shopping, strawberries, succulents, sugar, Traverse Bay Farms, vegetable, white carrot. Bookmark the permalink.